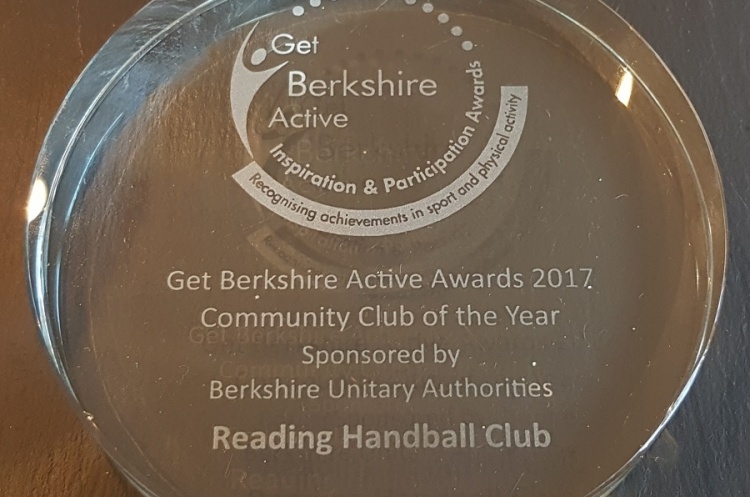 Reading Handball Club is celebrating after they were named the Get Berkshire Active Awards Community Club of the Year 2017 in a ceremony at Reading’s Hilton Hotel. The first handball club in Berkshire fought off competition in the public vote from fellow finalists Reading Rockets Basketball Club and Sand Martins Golf Club, despite its relatively short existence. The inaugural handball taster sessions – organised by Get Berkshire Active themselves – took place as recently as 2013. The club was formed soon afterwards and the men’s team, Reading Lions, joined the English league in 2014. The women’s team Reading Lionesses, followed suit a year later. The club has enjoyed success on the court. The Lionesses are on course for a third straight league title and a second cup win. The Lions have achieved two promotions and are hoping to add cup success this season after taking the silver medals last year. However, it is the hard work that Reading puts in week-after-week that has led to them being recognised by the local sporting community. The club, based at Loddon Valley Leisure Centre, has worked tirelessly to offer young people in Berkshire the chance to participate in our exciting, high scoring, action packed team sport - which they would otherwise have no exposure to. This has been achieved by running coaching courses, then sending the new coaches to schools in Reading, Arborfield, Bracknell, Ascot, Slough and other places across the county to run sessions for the enthusiastic teenagers. The coaching sessions have been so successful that the club’s primary aim for 2018 is to start a junior section. Reading has also organised regional schools competitions and helped with PE GCSE examinations, as more young people are choosing handball as one of their graded sports than ever before. Reading prides itself on its inclusive, positive environment. Despite having players from all corners of Europe and even further afield, the unity and the bond between players is second to none. This season the Lions and Lionesses introduced a second weekly training session aimed specifically for beginners or those returning to handball. Even with the introduction of these sessions, the approach at the main training session of adapting to fit the needs of all abilities and including everyone remains the same. If you are interested in trying handball or want to know more about the newly crowned Community Club of the Year, please contact readinghandballclub@hotmail.com or find them on Facebook.